Hybridizing is as simple as playing bee. Yes, I said bee. Hybridizing is full of wonder, leaving us full of delighted anticipation. Choose the plants which characteristics you most admire. eg: the size of bloom from one and the height of another. Once you have chosen your parent plants it is time to get to work!! 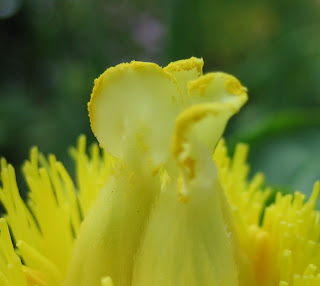 Once you have chosen the the mother watch the bud as soon as it starts to show colour remove petals and stamens. Cover the carpels and stigma all over with the pollen. Make sure you keep track of your crosses for future reference. In September, collect the seeds when pods mature. Mix 1ml bleach to 100ml water and rinse seeds, then rinse in fresh water. These seeds may be planted directly to the garden. Or you can put the seeds in a Ziploc bag containing damp vermiculite. Store them in a warm, dark room. Check seeds every week. After a few months, you should see a small white root appear on the seeds. When root has reached a half inch, place in another Ziploc bag with humid vermiculite. Place bag in refridgerator. Check seeds regularly. After a few months you should see a tiny leaf, (plumule). When the plumule appears, remove the germinated seed from the refridgerator. Plant in a 4"pot with potting mix. Keep in the house, in a sunny place (no direct sun) until your last frost outside. After that, you can plant it in your garden. In the fall, protect it with a mulch. Your seedlings will take 3 to 4 years before its first flower when you will finally know if you succeeded in your choices.